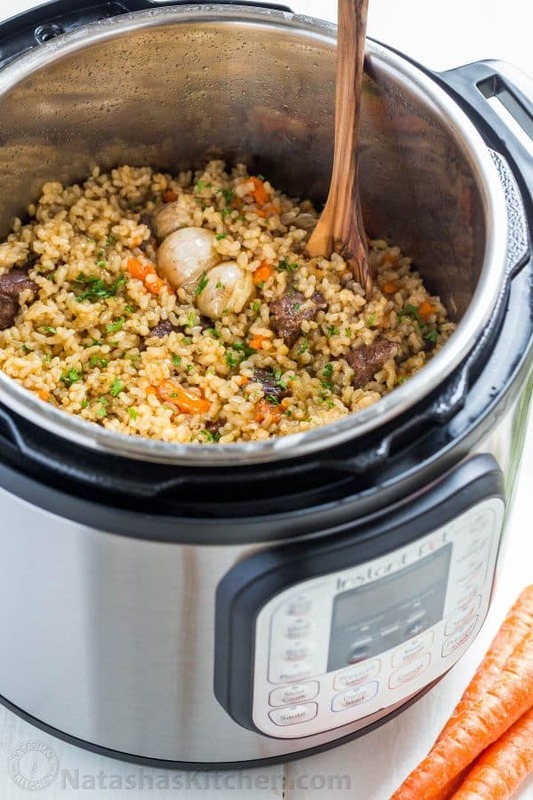 This Instant Pot Rice recipe is a healthier, juicier and flavor packed rice pilaf called plov. It all comes together in 1 pot (the instant pot!) and you won’t believe how quick and easy this is. 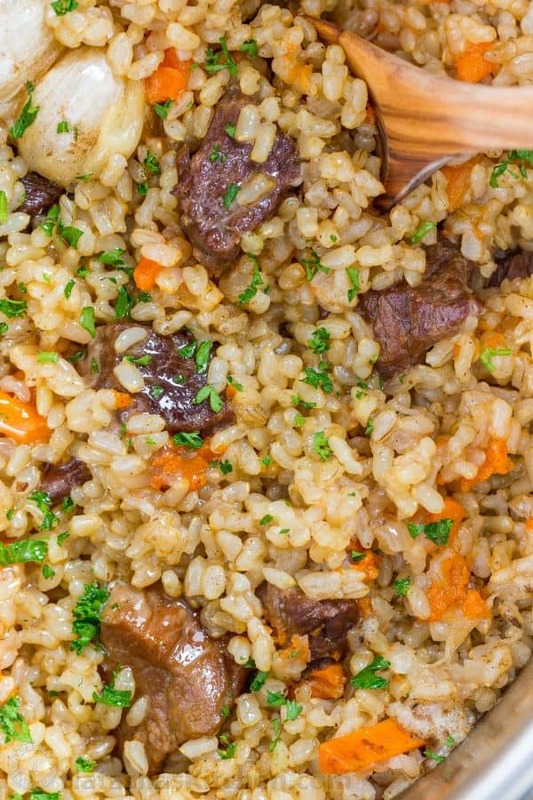 Traditionally, beef plov is made with white rice, but we used a brown rice which was perfect for the instant pot because it doesn’t get mushy while the beef becomes melt-in-your mouth tender. Brown rice is also way healthier and your hungry people may not even realize it is brown rice. It works so well in this recipe! My husband gave me this Instant Pot for Christmas and I am already completely smitten with it! If you own an instant pot, chances are you are obsessed with it also. 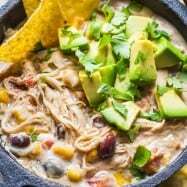 Let me know about your favorite instant pot recipes in a comment below. I’m so excited to put this amazing little pot to work! 1 whole head garlic, unpeeled, cut in half crosswise. *TIPS FOR SUCCESS: We used organic short grain brown rice (I buy the “Lundberg” brand bag sold in Costco). DO NOT USE quick cooking rice, parboiled or white rice – these would all need modifications in timing and water. Use a standard measuring cup or a kitchen scale to measure the rice (not the measuring cup that comes with your instant pot). 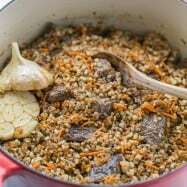 If you don’t own an instant pot yet, you can still make beef plov on the stovetop with this recipe and check out the creative grain we used in this newer version – wildly delicious!! This instant pot plov also reheats really well on a skillet the next day so leftovers are a great thing! Have you gotten on the instant pot wagon? It was actually this recipe that made me fall in love with my Instant pot (ahem 2 hours instead of 15 hours? YES!!!). What is your favorite recipe to cook in the Instant Pot? I am always looking for new ideas. Thanks in advance my friends. I always love hearing from you :). Can this be done with NO SALT and still be ok? I only have long grain brown rice. Is that ok or should I use short grain white? If long grain is ok do I need to adjust anything? Hoping to make this tonight. I cooked this tonight with thin cut steak chopped into small strips. I reduced the pressure to low and kept it at 30 mins. Hi. Thanks for this great recipe ! 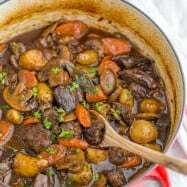 Is there a way to make this recipe in a regular pressure cooker? I LOVE your recipes as they are healthy and so tasty, and you are so much fun as you do your videos! Made your plov a few times! Turned out really good! 🙂 now I am thinking to try making it with chicken, any suggestions? Maybe cut up in cubes when the chicken is still a little on a frozen side and make it without brown it? Or just brown brown it like I do with beef? Just finished your IP plov dinner. Super good dish, will make again. My wife raved about it. 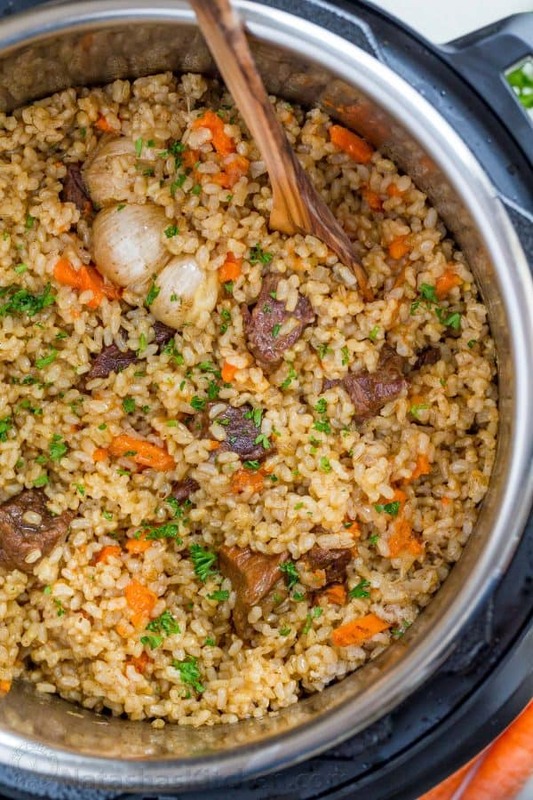 This plov recipe is the first thing I cooked in my new instant pot! It came out delicious and meat was sooo tender! It sure beats the long method I did on the stove top! Hi Natasha! Thank for making this in an Instant Pot. Makes life SO much easier!! Natasha thank you very much for this delicious recipe!! Made it today and it was very tasty!! 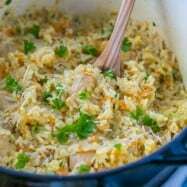 Would love to see a recipe for white rice plov in the instant pot. Made it’s exactly as written and it’s delicious! Will try that next time 🙂 thank you! Also, would 2 cups of water work better? 3 cups worked fine for us. If you choose to lessen the amount I can’t say how it will turn out. Let me know how you like it if you experiment! I LOVED this recipe! I was a little concerned with putting the garlic in as it stated but oh my God, it worked. I used a medium grain brown rice and it worked great. The only comment I have it that your recipe doesn’t state what type of butter to use in the first ingredients list. On the printer version it says “unsalted”. I ended up using salted butter but decreased my salt by half and it worked out fine. I bought my instant pot a few years ago and have since made all manner of things in it. It is just so handy. I probably use it at least four to five times a week. This recipe looks fantastic and I love that you used a short grain brown rice. I buy the same Lundberg rice and so always have it on hand. I plan to make this next week, but I wondered if you have ever tried it with a no sodium beef broth instead of water? I think I might try that myself. 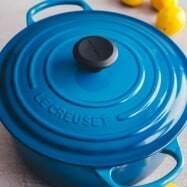 What setting do i need to use in order to bake in the instant pot? did you add parsley to this recipe? 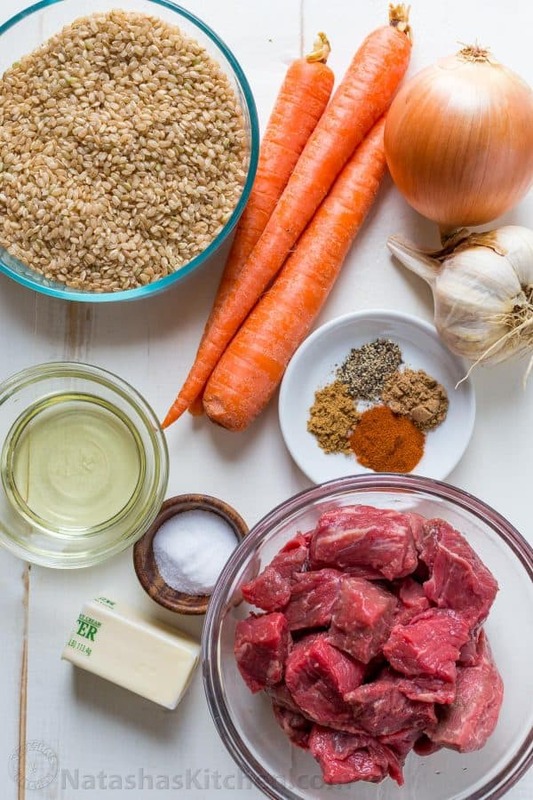 Hi Tamela, one of my readers, Olga, reported the following: “I was looking for a plov recipe similar to my moms; however, instead decided to try this one with beef and brown rice (was a first time). I did do 2lb of beef and doubled all seasonings. I also did 5cups of rice and 5 cups of water. Fit to a T in the 6QT. When doubling this recipe, do I keep the same time? Thank u for your time! Can’t wait to try! Thanks Natasha, love all your stuff and recommendations, newsletter & YouTube subscriber. Please keep showing IPot recipes, I’m a new user. Really love plov and cooking in the instant pot! Looking forward to try making it using your recipe next week. 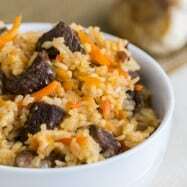 I was looking for a plov recipe similar to my moms; however, instead decided to try this one with beef and brown rice (was a first time). I did do 2lb of beef and doubled all seasonings. I also did 5cups of rice and 5 cups of water. Fit to a T in the 6QT. Hi Natasha, I wondered if you could substitute beef broth for the water?